In 2010, a federal court ruled (Cumbie v. Woody Woo Inc.,596 F 3d 577, 9th Cir) that if an employer pays the federal minimum wage, it can require that gratuities be shared among the entire staff. In 2011, The Labor Department under President Obama fully rejected that court’s decision and issued regulations that stated that employers could not require mandatory tip pooling with the back of the house employee. 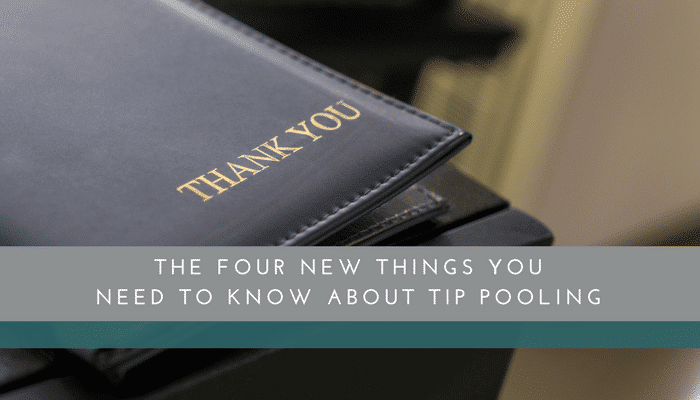 In 2016, the Ninth Circuit Court of Appeals ignored their prior decision (which covers California along with 7 other states) and upheld the 2011 DOL rule change, so in these states, the tip pool could not be split with the back of the house. This changed on March 23rd. On March 23, 2018, as part of the omnibus budget bill signed into law by President Trump, the FSLA is amended to allow all employees to participate in a tip pool. The new FSLA rule does not allow owners to keep restaurant tips. This reinforces the current California rule prohibiting owners and their agents (managers, supervisor, etc.) from keep any portion of the tips or to participate in the tip pool. There are forty-two states which currently have a “tip credit” in place with allows them to pay less than the Federal minimum wage. Each state has its own minimum wage requirements (either at or above the federal minimum wage) but can pay a reduced hourly rate if that wage plus the tips received satisfy their minimum wage requirement. Example: Delaware Combined Minimum Wage rate is $8.25; the minimum cash wage is $2.23 so the tips received must come to an average of $6.02 per hour for tipped employees to satisfy the wage requirements. This rule change will have potentially the largest effect on the eight states (including California) that require employers to pay the full state minimum wage to tipped employees. California restauranteurs will have the opportunity to enact new tip pooling guidelines that now can include distributions to the back of the house employees. This could help operators with the challenges of increasing wages and a shrinking labor market. The employee tip pooling policy needs to be updated and included in a restaurant’s employee handbook. We always recommend you contact your labor attorney for the specifics given your circumstances and policies. Once you have made your decision, we at KROST can help you set up a personalized Tip Pooling system to fit any type or size operation and take the confusion and difficulty out of implementing and maintaining these protocols. We will help with your current POS system and can also recommend the latest in tip management software solutions. If you have any questions or need assistance in setting up your own tip pool distributions, please contact us.